Raumfahrt+Astronomie-Blog von CENAP - Blog: Astronomie - Asteroid Bedrohung im Jahr 2032? Keine Panik! Astronomie - Ein Forscherteam entdeckt den Standort von massiven Schwarzen Löchern durch das Virtual Observatory. Astronomie - Asteroid Bedrohung im Jahr 2032? Keine Panik! Astronomie - Kepler findet erstes bekanntes geneigtes Sonnensystem - Beobachtungen zeigen zwei Planeten welche ein Stern in einem 45-Grad-Winkel umkreisen. A big asteroid sailed past Earth last month, and astronomers haven't yet totally excluded the possibility that it'll hit us when it comes around in 2032. If the past is any guide, we won't have to worry about asteroid 2013 TV135 — but it's a reminder that we'll have to fend off a killer space rock one of these days. Ukrainian astronomers discovered 2013 TV135 just 10 days ago, well after the asteroid had its close encounter with Earth on Sept. 16. Actually, it wasn't all that close: The distance was 4.2 million miles (6.7 million kilometers), or about 17 times as far away as the moon. But based on the rough estimates of its orbital path, experts rated its chances of colliding with Earth during a follow-up encounter in 2032 at 1 in 63,000. "To put it another way, that puts the current probability of no impact in 2032 at about 99.998 percent," Don Yeomans, manager of NASA's Near-Earth Object Program Office at the Jet Propulsion Laboratory, said Thursday in a statement. "This is a relatively new discovery. With more observations, I fully expect we will be able to significantly reduce, or rule out entirely, any impact probability for the foreseeable future." Earth has faced tougher odds: At one point, astronomers gave the asteroid Apophis a 1-in-40 chance of hitting Earth in 2029. Further observations ruled out any chance of impact in the foreseeable future, and the case of 2013 TV135 will almost certainly play out the same way. That didn't stop Russian Deputy Prime Minister Dmitry Rogozin, who has space research as part of his portfolio, from tweeting an alarm. "'A 400-meter asteroid threatens to blow up the Earth,'" he wrote in Russian. "Well, that's a super goal for domestic space." Just last month, Energy Secretary Ernst Moniz signed an agreement with Russian officials that the Energy Department said would include seeing whether nuclear weapons could be used as a means of asteroid defense. Nukes or not, asteroid defense is an international issue well worth contemplating: A space rock that's 1,300 feet (400 meters) wide could destroy a region or set off a huge tsunami if there were a direct hit. The asteroid that caused a meteor blast over Russia earlier this year, injuring more than 1,600 people, was a mere 17 meters (54 feet) wide when it hit Earth's atmosphere. The United Nations is in the midst of figuring out the procedure for international action in the event of an asteroid catastrophe — and NASA's OSIRIS-REx mission, due for launch to asteroid Bennu in 2016, may help astronomers develop strategies for diverting a potentially threatening space rock. But for now, the big challenge is to identify and characterize near-Earth objects on a timely basis. The fact that 2013 TV135 was discovered only after last month's close encounter demonstrates how far we have yet to go. 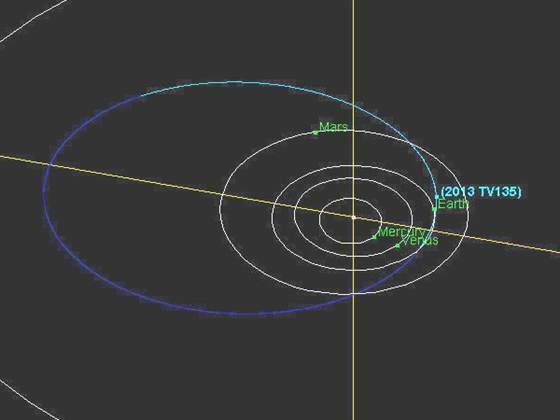 This graphic shows the orbit of 2013 TV135, which ranges out to three-quarters of the distance to Jupiter's orbit. The asteroid's orbital period spans almost four years. A potentially catastrophic asteroid has been discovered by astronomers, who say there’s a slim chance that the 410-meter-wide minor planet will crash into Earth in 2032, creating a blast 50 times greater than the biggest nuclear bomb. The asteroid, described as 2013 TV135, was found in the Camelopardalis (Giraffe) constellation by the Crimean Astrophysical Observatory in southern Ukraine, the Minor Planet Center of the International Astronomers Union said. The discovery has been confirmed by astronomers in Italy, Spain, the UK and Russia. In Russia, it was seen with telescopes at the Master Observatory in the Siberian republic of Buryatia, the IAU Minor Planet Center said. The asteroid has been added to the List of the Potentially Hazardous Asteroids, which includes celestial bodies with orbits closer than 7.5 million kilometers from the Earth’s orbit. However, the threat posed by 2013 TV135 is minor, as it only has a one in 63,000 chance of colliding with our planet, according to available estimates. Astronomers say the asteroid’s orbit will be about 1.7 million kilometers away from the Earth’s orbit on August 26, 2032. If the asteroid hits Earth, it would create an explosion equivalent to 2,500 megatons of TNT, which is 50 times greater than the biggest nuclear bomb ever detonated. 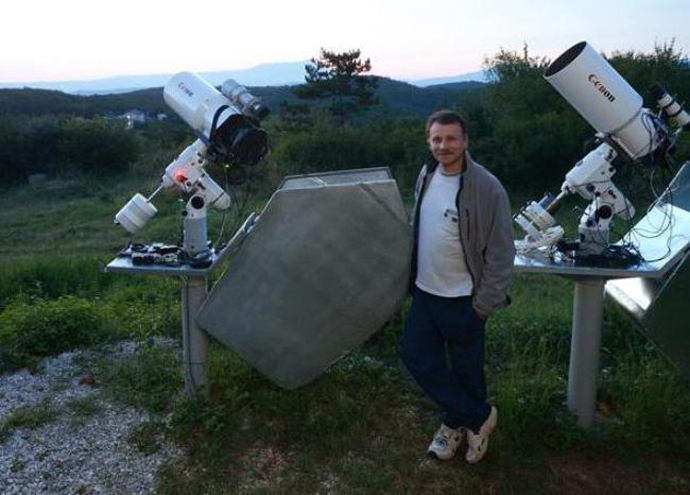 The man behind 2013 TV135 asteroid discovery, Gennady Borisov from the Crimean Astrophysical Observatory. Scientists will be able to better evaluate the impact risk of 2013 TV135, and even determine its possible impact site on Earth by 2028, Timur Kryachko from the Crimean Astrophysical Observatory told the RIA Novosti news agency. The discovery was mentioned by Russian Deputy Prime Minister Dmitry Rogozin, who is pushing for the development of anti-asteroid defense systems. “Here’s a super-task for our space industry,” Rogozin said of the asteroid on his Twitter page. According to NASA’s Near Earth Object Program, there is currently just one asteroid that has the same rating. It’s called 2007 VK184. At 130 meters wide, it has 1 in 1,820 chance of impacting Earth on June 3, 2048. The chances that any other near-Earth asteroid will crash into earth in the next 100 years is estimated at “effectively zero” by NASA.